3/16 ID x 13/32 OD Clear Braided Hose by the foot. 3/8 ID x 5/8 OD Clear braided hose by the foot. 1/2 ID x 3/4 OD Clear Braided Hose by the foot. 3/4 ID x 1-1/32 OD Clear Braided Hose by the foot. 1 ID x 1-5/16 OD Clear Braided Hose by the foot. 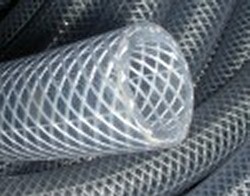 1-1/4 ID x 1-3/4 OD Clear Braided Hose by the foot. 1.5 ID x 2 OD Clear Braided Hose by the foot. 2 ID x 2-1/2 OD Clear Braided Hose by the foot.